You're really taking me back to a wonderful set of memories. No show I can remember watching when I was young had a greater impact on my understanding of science, history, and technology than did Burke's incredible “Connections” (see http://en.wikipedia.org/wiki/Connections_%28TV_…). I honestly never hear anyone mention his name, and he's also one of my heroes. I know exactly what you're talking about, and wish we had television now that did what he was doing back then. To imagine being able to think and learn at the same time you watched, I've never really experienced its equal again. I watched Connections as much as possible as a child – that show was mind blowing to me as a kid. It taught me that non-linear thinking, seeing the semantic joins between things, was a valid way of thinking (despite what my education was teaching me – that lateral thinking was irrelevant and wrong). His shows are brilliant pedagogical lessons that should be viewed by educators, advocates and activists across the country. One of my favorite shows too…you can view it online on youtube. I could not agree more. 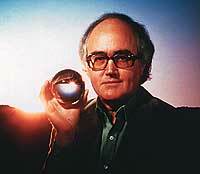 James Burke is fascinating, engaging, and changed the way I look at the world.